April Greetings from Block Party Studios! Greetings to all our Friends of Fabric! April is upon us, and things start to get into full swing here at Block Party Studios. safe travels to the "International Quilt Festival" in Chicago, IL, April 7-9th. her other angel pins, "Patriotic Angels", "Scripture Angels" and "Pink Ribbon Angels" for breast cancer awareness. We will have all of these pins at the Chicago Quilt Festival! 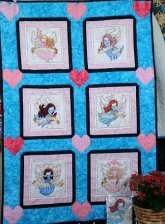 Check out how beautifully the "Healing Hearts" panel from "RJR Fabrics" turned out! happy to announce --- Block Party Studios well be offering a class! 16th from 9:00-1:00. Cost for the class is $30. Class size is limited so call or stop in and reserve your space soon! 1-800-419-2812. So Friends, we hope to see you soon at Chicago, in our store, or at our T-Shirt class. And as always, thank you for being the best customers on earth!